The Ornithology Library in the Lyman K. Stuart Observatory at Sapsucker Woods is part of the Cornell Laboratory of Ornithology. It is also an affiliate of Cornell University Library and maintains a close working relationship particularly with the Albert R. Mann Library. Since the Lab is located several miles from the Cornell campus, the collection serves as a convenient source of reference for its staff. It supplies considerable material for the Lab's public education and research programs and is consulted regularly to answer the many questions the laboratory receives from all over the world on the subject of birds. Ornithology Library books do not circulate, but visitors are welcome to use them in the building. Most of the books duplicate titles held at Mann Library or, in some cases, in other Cornell campus libraries. 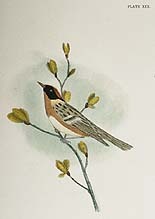 Catalog records for the Ornithology Library's holdings are included in the national library databases and the Cornell University Library Online Catalog. The book collection in the Ornithology Library numbers about 3,000 volumes. It is particularly strong on field guides and on publications that cover bird families, or species, worldwide. Although the Ornithology Library has copies of some historical titles, it does not attempt to keep a rare book collection. The Ornithology Library has two special book collections of interest. One is the William D. Sargent Collection on Falconry, which contains about fifty historical volumes from Sargent's personal library. The second special collection is that of publications illustrated or written by Louis Agassiz Fuertes. Although copies of the Fuertes titles are also available in the Mann Library collection and in some cases in the Ornithology Library's general book collection, the Lab is unique at Cornell in assembling these titles in one grouping. The Ornithology Library, like Mann Library, has many of the major ornithological journals, including historical runs of such titles as Audubon, Auk, Condor, and Ibis. In addition, it has a unique collection of locally-oriented newsletters and magazines issued by bird clubs and societies. Coverage of United States publications of this type is extensive. A special effort is made to acquire all publications of the some forty-five organizational members of the Federation of New York State Bird Clubs. Back files of some newsletter titles are also maintained if the content is deemed of continuing interest to Lab staff and patrons. In many cases, though, only current issues are kept. In all, the Ornithology Library holds partial or complete runs of several hundred serial titles. Only a very few of these are recorded in the national or Cornell databases. Information about specific holdings of a title may be requested from the staff of the Ornithology Library. Most journals and newsletters are received as part of an active exchange program for the laboratory's publication, the Living Bird. The Ornithology Library exists primarily to serve the staff of the Cornell Laboratory of Ornithology, but it also acts as a backup to the various ornithology collections in the libraries on the Cornell University campus.